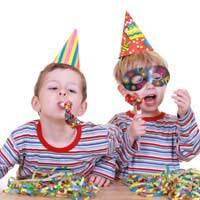 When planning your child’s birthday party it is essential that you try and keep things running as smoothly as possible to ensure that you stay calm and collected and that the children also have a great time. When sending out invitations think about how many children you can handle at the party, each invite should have a section for an RSVP on it so you can know the exact amount of attendees before the date. These can either be handed out at school by your child or to the parents if you know them and see them often. Parents may be invited along to the party as this ensures a bit of extra supervision and help in controlling some excitable kids. This depends on your child’s preference and the size of your home, if you are comfortable to have a group of children in your house then by all means hold the party there. This can be a nice, low cost way of finding your children somewhere to have fun. If you wish to go somewhere else then there are so many options open to you such as kids play barns, activity centres, restaurants all these will be able to provide some sort of tailored party package so you have to do less work. Also there will be staff on site to help with the supervision. Having good entertainment is a great way of stopping your children from running riot around your house or venue. If you have chosen a venue other than your home it is likely that they will provide their own games and equipment so you have nothing to worry about. Think about playing traditional party games such a pass the parcel, musical statues and other classic games these will ensure that the children go home nice and tired, something the parents will no doubt appreciate. When choosing your food and drink try not to make everything so full of sugar that all the children will be hyperactive until home time. As well as the cake and fizzy drinks also try providing sandwiches, cocktail sausages (without the sticks), fruit juices, water and fresh fruit such as strawberries. This will ensure that the children leave feeling well fed without the hyper activity of excess sugar. It is advisable to have more than one adult at a party especially if there are a lot of children, it is best to have one adult for every six children although you might want more if there are a lot of little guests. Other parents might be interested in coming along, it is a chance for them to socialise with their children’s friends and meet some other parents. As if the parents would like to come along on your invitation, make sure you provide adequate food and drink for them also. Having other parents there will allow you to relax and enjoy yourself, the party should be fun for everyone involved not stressful.